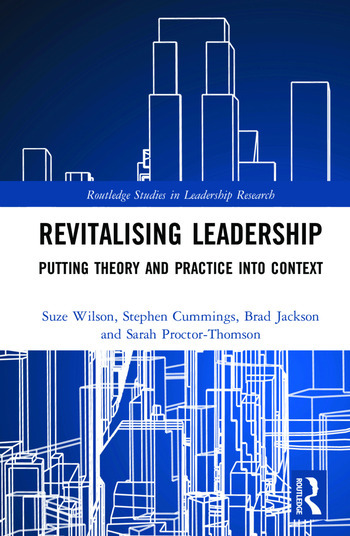 Revitalising leadership connects leadership theory and practice with context. It argues that the universal prescriptions favoured by most leadership scholars ignore the reality that context always matters in leadership practice – and so it should matter in leadership theorizing too. Addressing this gap, the book offers a novel framework that enables the development of context-sensitive leadership theory and practice. This framework directs theoretical and practical attention to the key challenges for leadership in different organizational contexts. It involves developing a specific purpose for leadership in a given context, as well as formulating the values, norms and domains of action which should guide leadership efforts in that context. Determining these various matters then informs the role, responsibilities, rights, behaviours and attributes relevant to leaders and followers for that context, and the focus, purpose and boundaries of the leader-follower relationship. Deploying this framework, six in-depth illustrative theorisations are provided, showing how leadership practice might best take shape in the contexts of supervisory management; HR management; innovation and entrepreneurship; strategy; governance; and leadership studies itself. Revitalising leadership will appeal to diverse audiences, due to its theoretical novelty, its diversity of illustrative examples, its practice-focussed orientation and its clear, engaging style. These include leadership scholars concerned with the lack of attention being paid to context in leadership theorizing; organizational scholars wanting to learn how leadership thinking can be brought to bear on the different management functions the book explores; practitioners seeking leadership ideas that are tailored to the context they lead and follow in; and those involved in MBA or leadership development programmes who are looking to combine the personal reflection sought by such programmes with a thoughtful analysis of the context in which their leadership practice takes place. Suze Wilson is a Senior Lecturer at the School of Management, Massey University,Palmerston North, New Zealand. Stephen Cummings is Professor of Strategic Management at the Victoria University of Wellington, New Zealand. Brad Jackson is Professor of Public and Community Leadership in the School of Government Victoria University of Wellington, New Zealand. Sarah Proctor-Thomson is Senior Lecturer in the School of Management at the Victoria University of Wellington, New Zealand.